I haven't experienced any with my playthrough from versions ago. Idk what else to do if they are present. I don't have time to do a personal playthrough with no crash's glitches happening. Idk, I'm getting pretty burnt out with the SRAM, I'm working right now, idk when I can check to make absolute certain that the SRAM is fine. I've experienced the exact same issues in two playthroughs, one in 1.4 and one in 1.5. That 10-minute video I PM'd to you of the 1.5 game shows some of the most glaring issues, mostly involving heart pieces respawning. At the end of the video, I have gotten 24 heart pieces out of 20, and the save file has a glitched-out number. Last view: 12 days I'll look into it. Found the issue. When saving & quitting, I back up my upper/lower world id in preparation for restarting the lower light/dark world. The special forced save and quit after defeating ganon lacks that routine, and I watched a specific portion of the SRAM change when it shouldn't have. So now that is all set. There are no more resetting treasures or other things. Last view: 1530 days Does this mean that items no longer disappear if you reset without saving? Last view: 12 days No that will still happen. You cannot reset before saving. If you want to quit, you must save via death or two player up*A in inventory. Last view: 1530 days Two player up*A... Sorry for being slow here, please bear with me. You mean push up and A on the second controller if you're playing on original hardware? Will that bring up a save menu? Just curious since I grabbed one of those physical releases from Flashback. I intend to play this on a real NES. Last view: 12 days The game has a hidden save feature within the inventory menu. This has always been the case for The Legend of Zelda. Last view: 1530 days I had no idea. Cheers for the clarification. I'll make sure to remember it. Last view: 1460 days That is a really good thing to know. One question, though. Is my bomb counter supposed to not be working? Last view: 1240 days This is pretty good hack; however I noticed some minor errors while running in PAL mode. On the save screen you can see some tiles at the top. This was unnoticed as as NTSC screens cut this out. Same thing here, you just need to shift the camera down by one pixel. Despite these nitpicks, this is still a good hack. I'm impressed. So was this fix added to 2.0 with a reupload, or will it be available upon the next release? Also confirmed that the bomb counter is no longer working - I imagine this has something to do with the key counter fix. This is pretty good hack; however I noticed some minor errors while running in PAL mode. The title screen one cant be fixed. That's just how PAL is. You can also clearly view this within Nintendulator, as it displays all of the vertical tiles in the $2000ppu range and the $23A0ppu range. 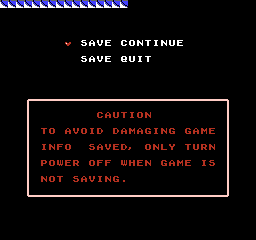 However, I did fix the Save & Continue ppu garbage up top. That is a really good thing to know. D'oh... This was done by poor bankswapping for the Key counter. I'm trying to stay away from using the HW bank to perform my swaps, cause the additional asm I'm adding is carving within the DPCM sfx... But, the bombs are now registering. ALSO, there was an sram issue after you defeat Final Ganon. It is now fixed. AND, I've also created a new function. Last view: 1157 days Hey thanks! I'm expecting very few bugs in this release. Also, thanks for making a .nsf file of the music! I noticed on the first post of this thread, that the Pendant of Quake isn't listed. Hey thanks! I'm expecting very few bugs in this release. I'm pretty much done with this, as long as there are no more crashes/freezes. I'll double check the front page, maybe the link is broken or something. Last view: 87 days Is Mapper 5 the latest, most advanced NES mapper? In other words, is it the most superior mapper to use in a NES game? I'm assuming it is, since you used it. Last view: 12 days Its one of the most superior, yes. I used mmc5, so I could have 1mb of prg-chr rom. Last view: 87 days In regards to the saving issue, what if you wrote a routine to have the game automatically save your progress whenever you pick up an inventory item or complete a dungeon, incase the player forgets to save themself? Do you have anymore free space to do that? I'm assuming not, or you may have done that already. Last view: 1157 days Finally got a chance to test 2.1, and I only got a minute in before I realized the bomb counter still isn't fixed. I'm still not gaining the bombs I pick up, which makes it futile to keep playing this version. Also, I second RetroRain's SRAM idea, if that's possible. Last view: 12 days No thats too much of a hassle, and I can't cram that in or alter the asm further. I'm sorry if people forget to save, but I've went out of my way to add that extra feature in the inventory menu, to make it more easier to save on your quest. That would really be overkill on adding SRAM to every obtainable item, along with dungeons too. I've given enough disclaimers, that people old and new to playing this hack, should know by now the importance of saving your progress. I appreciate your input, but I'm totally done with the SRAM. MySQL - queries: 131, rows: 172/0, time: 0.117 seconds.